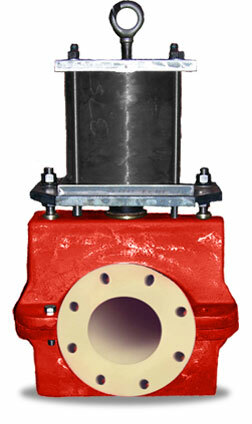 Red Valve’s Series 5700 Control Pinch Valve is a cost effectivechoice when centerline valve closure is required. The Series 5700 offers a 100% full round port opening and Class V shut-off. In throttling service, the 5700 provides true feedback positioning, and accurate, repeatable variable venturi flow control. There are no seats to grind, no stuffing box to repack, and no packing gland to adjust ever. The rugged, self-cleaning elastomer sleeve isolates all mechanical parts of the mechanism, so the operating torque remains constant.Full port opening and centerline closure is extremely important for larger size pinch valves in abrasive and high velocity applications. Patented by Red Valve Company in 1983, the Series 5700 with centerline closure outlasts all other types of gate, plug or ball valves on control of abrasive and corrosive slurries.Cone Sleeves can be specified to further enhance control performance and match the exact CV level desired. True feedback positioning is accomplished through the direct linkage of the pneumatic positioner to the valve stem shaft.